Using this as a reference, I've thought about starting a setting in the far future where Earth's oceans have shrunk down 4500 meters and I'm stuck on trying to describe what life (if any) exists on the world. Now I know carbon dioxide and other poisonous gases would be prevalent in the atmosphere. Just need help fleshing out what else might inhibit life. He was not a modest man. Contemplating suicide, he summoned a dragon. Temperature regulation would be way whacked. Do you think Earth would have turned into a hot box of greenhouse gases? I would imagine there would be huge bergs of salt floating around, or the oceans would turn white. Less ocean/increased salinity likely means less algae and phytoplancton, which would mean less breathable air. Don't even know if life would be possible at that point, especially given how sensitive certain insects like bees are. A thicker atmosphere would also mean less sun, so a new ice age would be very likely. Or alternatively, that the thicker atmosphere traps the heat inside, boiling everything away. Maybe call it roach world and have everyone play as cockroaches. Where are you putting the water in this scenario? So, for life other than cockroaches to survive, humans will have needed to genetically modify themselves to survive such a drastically different world. Whether to make it a world trapped in an ice age or a sun-baked world, haven't decided yet. And axlerowes, do you mean water as in drinkable and not poisonous to man or water in general? 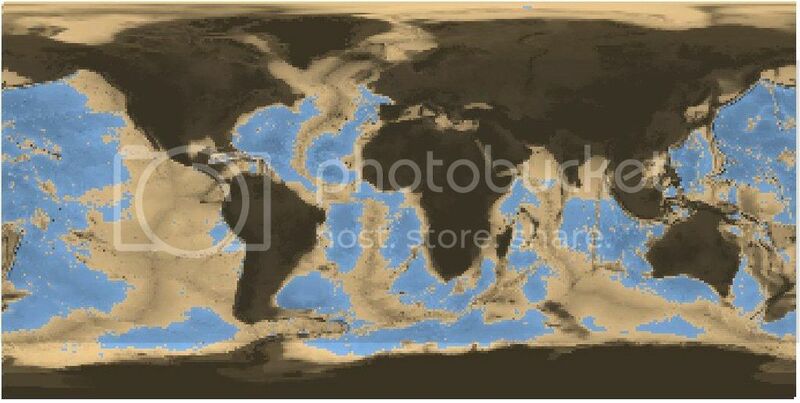 To the later, the Earth's oceans have receded greatly to where only a few can still be considered oceans, most having become isolated lakes and seas. Even if humans are still alive, they need to eat. And most animals and plants would die, so you need some kind of replicator technology or self sustainable archology agriculture preexisting. Water can always be recycled from bodily fluids ala Dune suits, plus there could be something like bio-domes available for more water. Anything that lasts would likely be manmade or somewhere deep below ground. But the water has to have gone somewhere though that is true, even if it boiled away, it won't just vanish. It's likely that it's bound up in thick cloud covers. So maybe a cycle of boiling and raining hmm. Could be an ice age. But in speculative fiction you could go farther, it is stolen, it is locked up in some other molecule. Do you want the water gone or do you want it distributed differently? For the record I have never liked that movie. Where, physically, did all of the water go? To drain the oceans down that far, you need to move quadzillions of tons of water. Where? If its all in the air, then you will have created a new Venus. Water vapor is an excellent greenhouse gas. Locked into the crust somehow? That will likely increase geological activity - even the removal of the water to another plane would have significant geologic impact as the plates 'spring up' from the reduced mass. No/low tidal effects would also impact the moons orbit slightly - its slowing down currently due to the tides. At -4500m, the standard barometric pressure is 162 kPa (1215 mmHg). This means that there is 160% of the oxygen available at sea level. Or, 37% Oxygen. This is close to where you need to have training to deal with higher O2 levels. Note also that fire hazards are greatly increased. Okay, working with all the great stuff everybody has thrown my way I've worked out a few more tweaks that I feel will begin to start coalescing into something approaching a recognizable outline of a setting. As to explain away the lack of water, I would prefer a science fiction scenario. One comes to mind of a gravity device somewhere near Earth (but not too close) malfunctions. If this is somehow not workable, please point it out to me so we can nix it and move on to the next possible way we could do it. So maybe a cycle of boiling and raining hmm. Love the idea of that happening. Now, when you say raining do you mean periods of monsoons or are we talking global flooding? A little more detail please on what you mean with boiling. Even the removal of the water to another plane would have significant geologic impact as the plates 'spring up' from the reduced mass. Would we see an event of sudden tectonic shifts causing new mountains and what not to be formed drastically? Also, responding more to your other point on oxygen, can life exist with too much oxygen? Would this cause the air pressure on the entire world to drop or increase? Well if you're going for sci-fi, then you're better off asking val than me. I just spout what I figure to be logical, but I lack expertise. Since the atmosphere thickens, the temperature would likely spike, which would cause lots of evaporation. That transpiration would then rain down, likely in a monsoon like fashion which would probably also lead to some flooding, big muddy torrents. Weather is rarely a global phenomenon, or rather its rarely doing the same thing in all the places at once. If it were though, coupled with what val said about the tectonic shifts. Earthquakes + monsoon + flooding + lots of violent thunder storms and twisters, I guess. About the extra o2, when there were dinosaurs, the air was actually richer in o2, otherwise those big things wouldn't have been able to live. So more 02 means bigger lifeforms, up to a point anyways, then it does indeed become toxic. Dunno about air pressure though. Easiest way to get rid of the water is strip off the ozone for an extended (geological) period of time and let stellar wind split the bonds in water giving you 2 O2 and 1 H2, because H2 is light enough to escape our atmo it gets blown off by solar wind. From what I've read on terraforming and current theories on why the other rocky planets in our system are the way they are, the most likely result of dropping oceans this much is runaway greenhouse effect, mainly due to how much carbon is sequestered in the oceans, and at 4.5km drop that is at least 60% of the hydrosphere right there. Another way to get the water to disappear is if we lost our moon, which would likely cause the same effects due to a lose of the magnetosphere, while also killing plate tectonics as the mantle cooled. Neither one of these processes are quick, and, assuming humans haven't lost the ability for space flight, it's within our technology right now to collect ice from the local neighborhood and drop it down our well to offset water loss on this scale. My suggestion, alien space bats are the culprit. You're also going to want some back of the envelope calculations on the salinity of the oceans, if only because at a certain point salt will start depositing itself on boat hulls leading to sinking boats. I only know this because guys were playing buoys out in dead sea and had them sink due to salt deposits overcoming the buoys' buoyancy. Assuming you're allowing for genetic engineering, oxygen toxicity in humans shouldn't be too hard to overcome, nor should the salty seas killing off all our current plankton, we already know of species that survive in suitably salty environments, and the oxygen toxicity can be dealt with using current technology by using simple air filter type thingy where some sort of simple lifeform just converts some O2 into CO2 before you breath it, just add sugar. In regards to your question about air pressure, it all depends on what happens. If we assume the makeup of the atmo doesn't significantly change, then the air pressure at our current sea level wouldn't really change. If we got venus style run away heating then you're looking at pressures increasing rather significantly. Also surface temps hot enough to melt lead, so no oceans at all. So yeah, just say alien space bats and pretend you're writing science fiction in the 30's, back when martian civilizations were totally possible. Okay. So, taking what Pariah and Goss have thrown my way, I've got a rough picture of the world. Somewhere in the near-distant future humanity has most of their hydrosphere stripped away by NAME OF ALIEN SPACE BATS, BLAH, BLAH, BLAH. Naturally, what happens is humanity has to fix itself to survive, but just barely. Let's face it. Only the rich, the scientists, and the military will be able to reach gene modifiers in time before the suddenly crazy planet kills you. Everyone with the few exceptions, are SOL. So, they splice some genes, play God a little, and bam. They're able to survive the first thousand years or so as the planet goes through a great period of change. First you have Earthquakes and volcanoes going insane and after that you get an ice age and, once the ice age peters out, you got life starting to make a come back with tribes of humans still existing. With the higher levels of O2 in the air, Earth's average temperature is actually a bit lower than normal so humans have evolved to be more hairy. Ala Planet of the Apes anyone? The ice caps are a bit larger so yay for any polar bears. Oh s**t, they're all dead. d**n. Tectonic activity, while hilariously outrageous after the stripping of the hydrosphere, has actually calmed down lower than Pre-Water Burglar event. However, the times the Earth does like to throw a tantrum, she throws big ones. Am I missing anything? Anything off?